I admit this was an (almost) impulse purchase. The combination of an attractive introductory price, exclusive colors, a generous gift with purchase and a bunch of items that were already on my "should test" list was too much to resist, even if it meant ordering sight unseen and from QVC, no less (yes, I'm ridiculous about certain things, QVC and HSN among them). Tarte Glow Your Way To Gorgeous 8-pc Maracuja &Clay Collection includes a bunch of full size products, mostly from Tarte's Amazonian Clay range. My previous encounter with their Amazonian items was quite successful: the black and green cream liners are in heavy rotation here. Everything comes in a cheap-looking but practical case that has inner pockets to hold everything securely. One of the GWPs that came with the Glow Your Way To Gorgeous set was the small bottle of Maracuja oil you see in the top photo.Please note that it is not part of this Tarte set. The oil smells like a nut cooking oil, and while I'm not brave enough to use it on my face it is a great hand and body moisturizer that absorbs instantly and calms minor irritations. 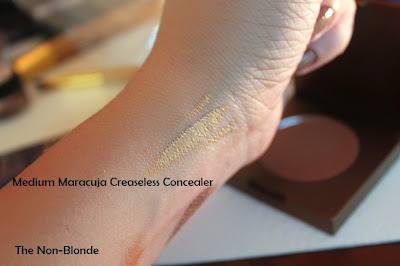 Maracuja Creaseless Concealer (Medium): This is a soft liquid concealer that needs some serious setting powder if you expect it to stay in place for a full day. It gives nice evening out coverage for surface redness but I'm not sure it will fully conceal anything serious and it doesn't do much for sun spots. 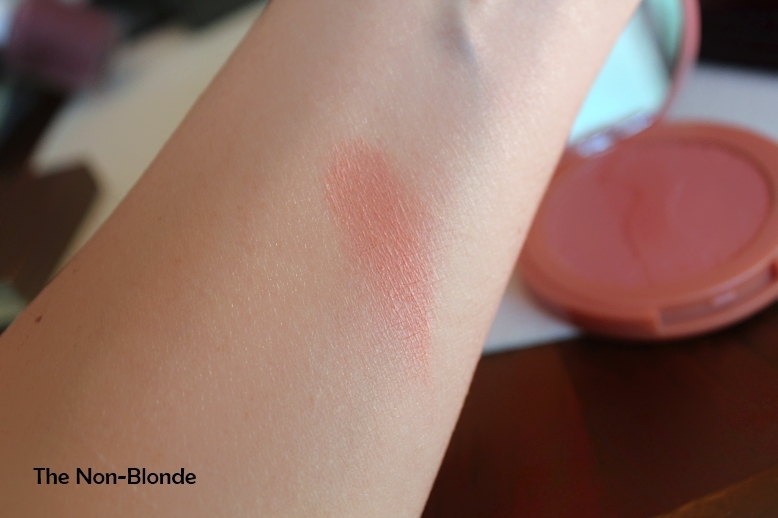 12-Hour Wear Clay Blush in Peaceful: It's a nice summery color, a soft and warm rose with nice pigmentation and easy enough to blend, though it's not the silkiest blush ever. I find this clay blush to be a little too dry, which is obvious is the swatch but not so on a fully moisturized, primed and foundationed face. It does last very well in NYC summer weather, but then again I always anchor and cement my makeup into place. 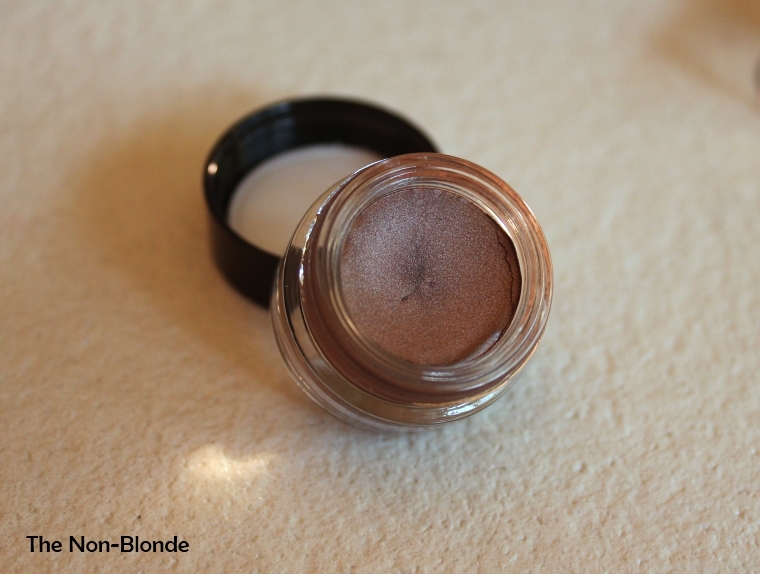 Amazonian Clay Waterproof Cream Shadow in Shimmering Taupe: What can I say? 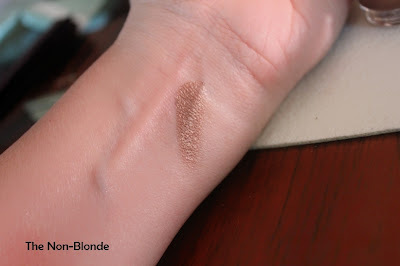 It's a taupe eye shadow, ergo love. The color is of medium intensity, the finish borders on metallic, the texture is soft and pliable. As much as I like it, used on its own (over a primer) it starts creasing almost right away- before I finish doing my makeup. Therefore I've been using it as a base under powder eye shadows. It works. Amazonian Clay SmolderEYES eyeliner in Fig: This liner reminds me the wonderful Sue Devitt Eye Intensifier pencils. 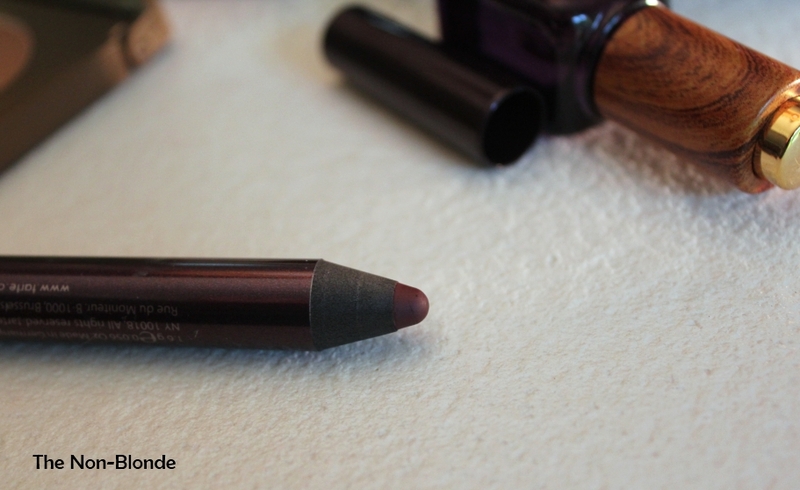 Soft texture that applies and blends with ease and depth of color make this liner/shadow base an excellent choice. The purple brown shade works in many looks and doesn't budge. Makes me want to explore other colors in the range. Lights, Camera, Lashes mascara in Black: I wanted to test this one because the other Tarte mascara I've tried (MultiplEYE) was beyond pointless and useless, so I was curious if it was a brand-wide issue. I was happy to discover it's not. 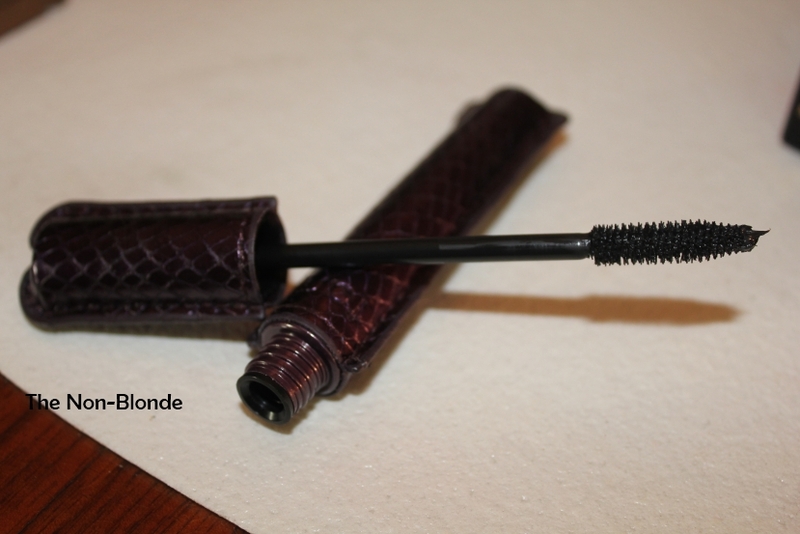 LCL mascara is quite nice; it holds a curl and adds length. I might write a comparison post between the mascaras at some point. 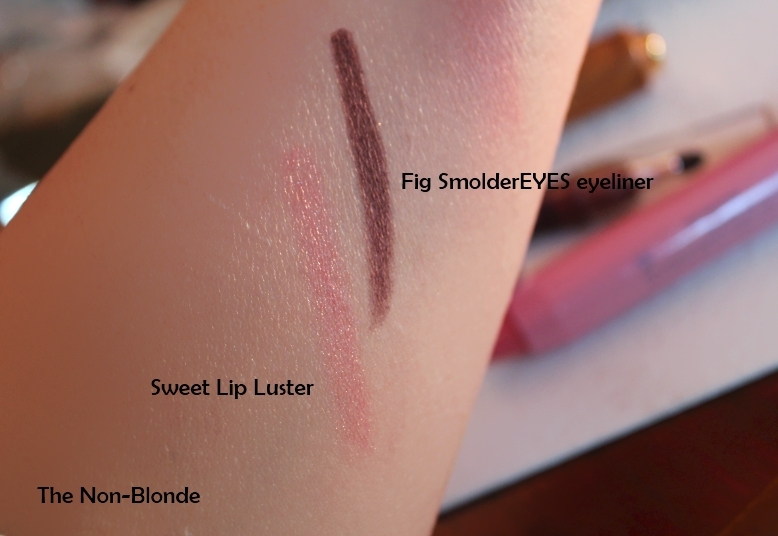 Lip Luster in Sweet: this was close to being a total fail for me. The soft peachy pink color is about four shades lighter than my natural lip color (maybe more. It made me realize how freakishly dark my lips really are). The color appeared chalky, milky and utterly unflattering. But the formula felt nice and soft, the strong mint scent went away in about a minute so I decided to take a deep breath and see if I can still put this pencil lipstick to a good use. What I did was experiment with using the Sweet Lip Luster as a base for very dark, difficult and/or vampy lip glosses I don't wear in the summer. 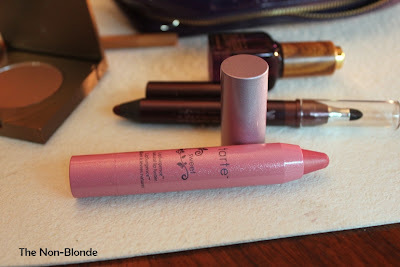 It worked better than I could imagine because Lip Luster's texture is thick enough to mix and absorb a second product. I'm actually going to get full use of this product. 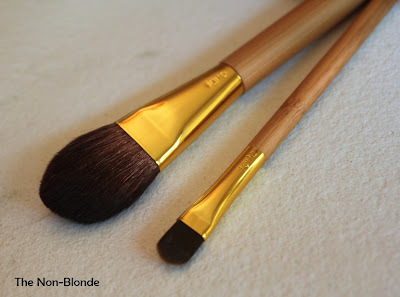 Brushes: Tarte makeup brushes are vegan, therefore made of synthetic hair. They're very soft and feel similar to Eco Tools brushes. I liked the blush brush well enough, though it can be too floppy for some textures. 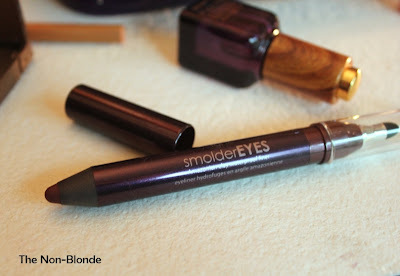 The eye brush is completely useless with powder eye shadows but good for the cream eye shadow that comes in this set and similar products from other brands. Bottom Line: a good deal on nice and wearable items even in the current almost full price. 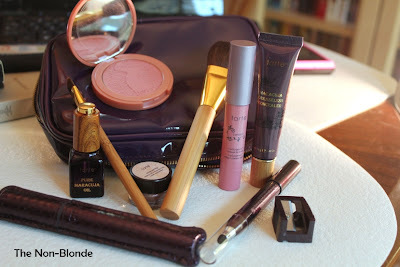 Tarte Glow Your Way To Gorgeous 8-pc Maracuja &Clay Collection ($55-$60) is available on qvc.com. Wow, just goes to shwo how different skin tones/types can have such different experiences. I love the concealer--I do always wear eye cream underneath but I love the coverage for the redness around my nose and the smoothness of the concealer. LCL is one of my fav mascaras, and I love all the shades in the kit--but then I am fair so that's probably the difference. 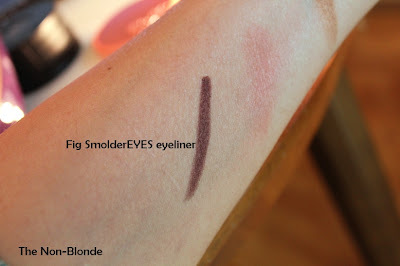 I do agree on the e/s brush--pretty worthless--just okay even for the cream eyeshadow. I also purchased this on impulse. 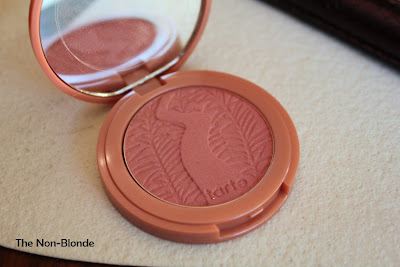 I agree that the blush is dry but the color is so pretty. The mascara doesn't smudge on me and I have had great luck with the eye shadow. No creasing for me. My least favorite item is the lippie. I like deeper, darker shades and this is too light for me.